Co-founder and executive chairman, Kathryn Moore Baker, was in private equity when she first met the team, and says she fell in love with the idea. “I loved the idea of doing something that was good for kids. I’m the mother of two girls, 18 and 14, and the whole time [the team was] telling me about the idea, I was thinking, I wished I had this when [my children] were getting their first introduction to social media,” she says. Baker, along with other angels, including Wibecke Nagell-Erichsen and international golfer Suzann ‘Tutta’ Pettersen, also invested in the company, which has now raised just under $1 million. Though based in Norway, the app is COPPA-compliant, a U.S. regulation related to software and services designed for children. Children aren’t marketed to, and their info isn’t shared, says Baker. Some may argue that children shouldn’t be using social media at all at a younger age, but that’s not entirely realistic. 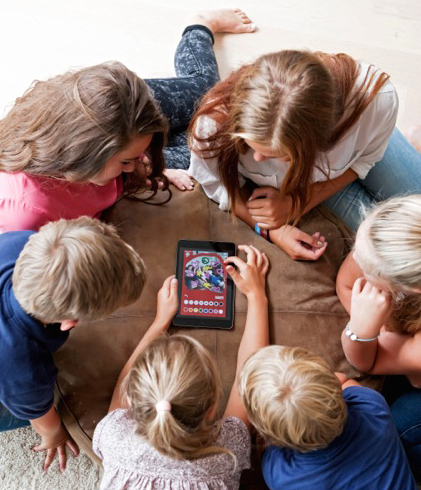 With Kuddle, they can at least have the experience of sharing on mobile with friends, while opening the door to productive conversations with parents about what’s appropriate. Kuddle, I feel, comes just in time for today’s youngest generation, as the kids of Millennials and Gen X’ers are now receiving their first smartphones at ever-younger ages (often now in the single-digits and pre-teens!). Even PBS is urging parents to “wait until preschool” at least. Though there’s a plethora of educational apps and games, younger children are naturally drawn to what the “big kids” use. Today, that’s social media services like Facebook and Instagram, where you’re supposed to be 13 or older to register. Many kids just lie, in order to sign up. Kuddle, which will always be free for children and will never sell things via in-app purchases, sees this app as the first step in a larger vision for the company which will focus on helping parents make better choices when it comes to their kids’ mobile usage, possibly through subscription services. “Our revenue streams will come from areas where we can help parents make good choices such as safer devices, child-friendly mobile subscriptions, and safer search engines,” hints Baker. These products will be developed in partnership with others, and will be marketed to parents who will make the final buying decision. In the meantime, Kuddle is a free download on iTunes and Google Play.